Alexa Diaz plays midfield for the SPU Falcons. See more pictures in this photo gallery. Alexa Diaz became the first Falcon women’s player to represent a national team in December when she laced up her boots for the Philippines. 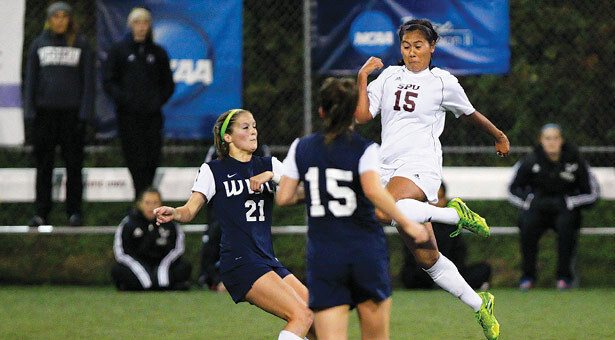 Diaz, a Seattle Pacific University junior, joined the women’s soccer national team, also known as the Malditas, to compete in the Southeast Asian Games, December 11–22, 2013. The Burien native, whose father is Filipino and mother is from Panama, played every minute of both games in Myanmar. The budding soccer nation has begun turning to Filipino-American college players to fill in its roster. Diaz joined SPU assistant coach Chalise Baysa on the squad. Baysa sometimes joins in during Falcon training, which made Diaz’s transition to being her teammate simpler. After attending a tryout camp in March 2012, Diaz made the team. She was supposed to join the team for Asian Cup qualifiers in May, but her proof of citizenship didn’t arrive in time, so she didn’t join the team until the Southeast Asian Games. The Philippines lost their opening game, 2–0, to the host nation and suffered a 7–0 blowout to eventual runner-up Vietnam. Even so, Diaz found special meaning in this competition. In Myanmar, the Malditas played for the pride of their country devastated in November 2013 by Typhoon Haiyan, which displaced 4.1 million people. Head coach Ernest Nierras, who hails from the badly hit city of Tacloban, obtained a flag from his hometown that traveled with the team. “It was very symbolic, and I loved that aspect of it,” Diaz says. SPU women playing abroad is nothing new. Since Chuck Sekyra took over as head coach in 2003, multiple players have signed contracts in European leagues: Meredith Teague ’09 played in Germany, Jocelyn Charette ’11 in Sweden, and most recently, Megan Lindsay ’13 in Iceland. Teague and Charette won the 2008 NCAA Division II championship with the Falcons, while Lindsay joined the team the next year. Diaz hopes to parlay her new-found international experience into a strong senior season, and she wants to join the list of former Falcons working overseas. But it wasn’t long – just long enough to get through the fall quarter, when basketball was the only program on the intramural docket – before he started making it something more. The pinnacle of the SEA Games experience for Diaz was playing the opening game of the tournament in a brand-new Mandalar Thiri Stadium, in front of a capacity crowd of 30,000. “It’s something I’ve always wanted, something I’ve always dreamed of,” she says.